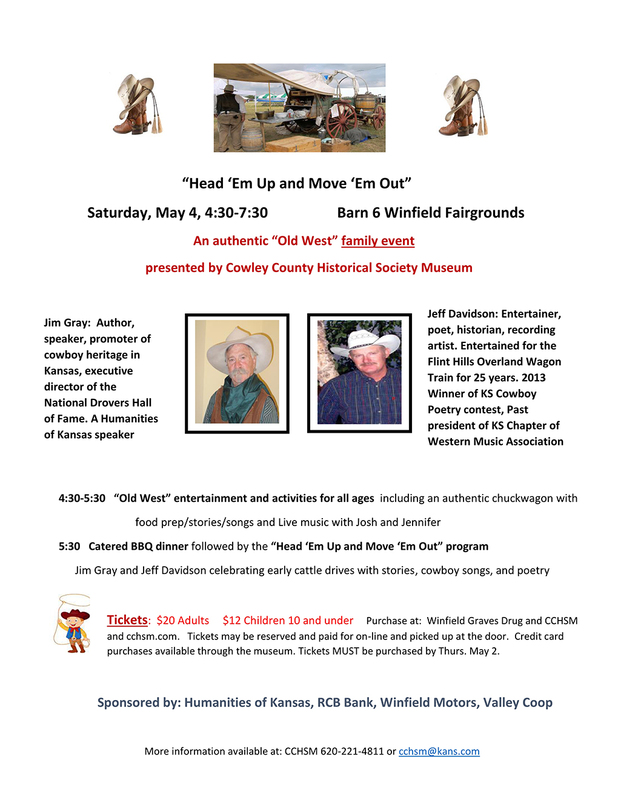 Saturday, May 4, 4:30-7:30, Barn 6 Cowley County Fairgrounds—"Head ‘Em Up and Move ‘Em Out” Experience the authentic Old West with a chuckwagon, “Old West” activities for all ages, BBQ dinner and a program presented by Jim Gray and Jeff Davidson taking you back to the cattle drives of Kansas. Family event: 4:30-5:30 Authentic chuckwagon with food prep/stories/songs, live music, “Old West” activities for all ages; 5:30 BBQ catered dinner followed by program presented by Jim Gray (Humanities of Kansas) and Jeff Davidson, “cowboy music and poetry”. Tickets: $20 adults, $12 children 10 & under. (includes dinner and all activities and program). View poster. Tickets available after March 25 at Graves in Winfield, and CCHSM. Contact cchsm@kans.com or 620-221-4811 for more information. Online ticket purchases will not be mailed out. They will be given at the event. There will be a follow-up with online sales through email.